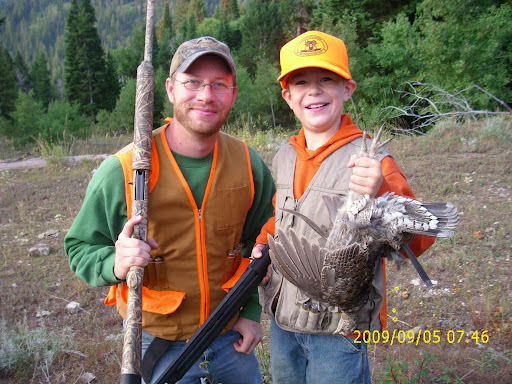 TAKE A KID HUNTING: YOU WON’T REGRET IT! Last Saturday, I had the priceless opportunity to take a good friend, Scott, and his ten year old son, Brigham, blue grouse hunting. They hunted the day before, but did not find any birds. I offered to take them to one of my favorite spots, Grouse Ridge. Brigham had just received his hunter’s safey but had never harvested an animal. He was sure excited! “Now, when we get to this place, we may find birds really close to where we park,” I stated prophetically. As soon as we pulled up, I let Sunny Girl out of the car and she ran right over to this rocky embankment not 20 feet from the car and struck a steller point as if it were scripted. “Guys, Sunny’s on point! Get your guns and get ready!” As I approached, a covey of five blue grouse erupted from the hillside below Sunny, but they flew too low such that a shot over Sunny would have been too dangerous. I do not shoot birds unless they are on the wing, but I have no qualms with letting a first time hunter like Brigham harvest his first bird out of a tree so that he can experience the thrill of success. I marked one of the birds in the highest reaches of a huge pine tree. “Brigham, do you see him up in that tree?” “Yep,” he responded. 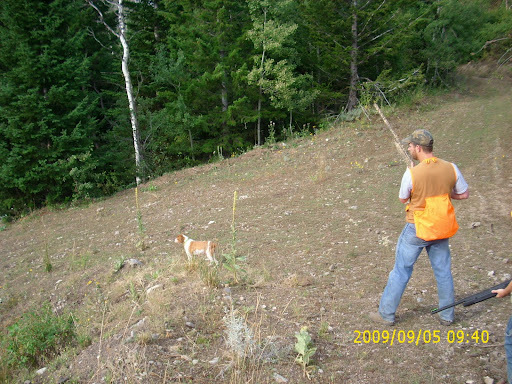 “Take him.” Brigham walked over, took aim, and made a nice forty yard shot on a grouse. “Sunny, fetch it up!” Sunny brought the big blue to hand. 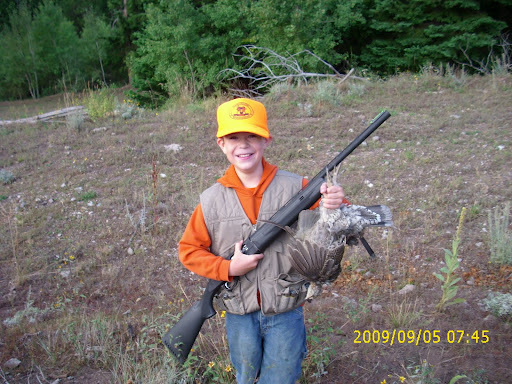 Brigham’s excitement over his first grouse was contageous. I was impressed with Brigham’s safety around firearms and his good hunting manners. He has been taught well. He is welcome to come hunting with me anytime. Brigham with his first blue grouse and a big grin. Scott, walkin’ in on one of Sunny’s points. Brigham and my daughter, Nessy, happen to be in the same fifth grade class. 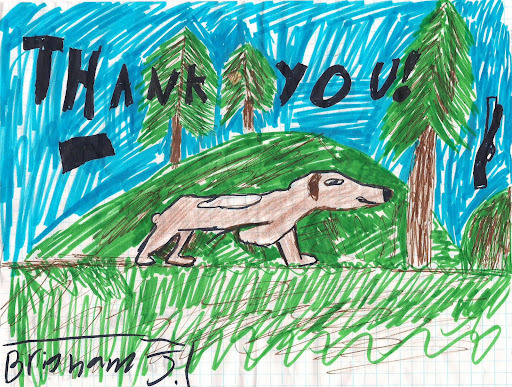 Tuesday morning, Brigham proudly exclaimed to Nessy, “Sunny retrieved my first blue grouse!” As a token of his appreciation, Brigham sent me this awesome picture he drew of Sunny on point. It’s times like these that help me to truly appreciate the joys of hunting and blessings we have to pursue our passions. Take a kid out hunting and I promise you will not regret it! Previous Post >Grousing for Trout! Next Post >Purple Shadows on the Prairie…Sage Y’hickens, It’s What’s for Dinner! Just great Andy! Just great! What a great gift for that young fella'.